In the comments section on Macro Business earlier today there was a suggestion to draw a chart showing the price of Gold relative to wages in Australia (after Macro Business published my charts showing Australian houses priced in Gold/Silver). With some time on my hands this evening I decided to see what the results were. I couldn’t find a single data set which provided Australian wage data that extended over more than around 20 years, so I have spliced together two different sets of data before graphing them (they were relatively in sync). From 1972 to 1994 I have used the total (weekly) full time average earnings (for an adult) from the RBA (LINK, see item 4.18) and for the period 1995 to 2010 I have used the total (weekly) earnings for a full time adult from the ABS (LINK, see Table 3). The AUD price of Gold was achieved by averaging monthly figures (to get an average price for the year) provided in a spreadsheet by the World Gold Council (LINK). 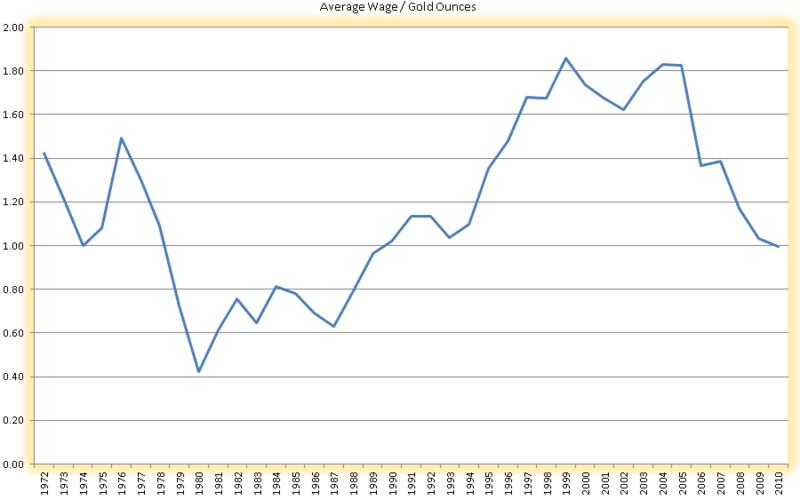 This chart shows the last 40 years, but how expensive was Gold relative to wages before that? In 1901, the average weekly wage for an adult male was about $4.35 for a working week of almost 50 hours, which after inflation equates to $217.50. However, wages have grown much faster than inflation, with the average weekly ordinary time earnings for adult males in May 2000 being about $830.00 for around 37 hours work, in far better conditions. While the ABS has shown that Gold has kept up with the pace of inflation, it’s not necessarily a good tool to use as an inflation hedge unless held over very long periods of time. The 30 year bear market after the last nominal peak in 1980 to 2000 is proof of that. Based on the above figures from the ABS the Wage/Ounce ratio was around .51 ($4.35 wage / $8.50 oz) in 1901. 20 years later and the ratio had changed quite significantly. At this time the price of Gold was fixed in USD at $20.67 an ounce. In 1920 the Pound was valued at USD$3.66, so in USD an Australian weekly wage was around $38.43 and bought 1.86 ounces of Gold. To get back to the .42 ratio seen in 1980 (remembering that is with the price of Gold averaged over the year) we would have to see Gold at AUD$3200 and obviously even higher assuming wages rose while Gold climbed to that level. Will we see the ratio fall back to the level seen in 1980? What are your thoughts? For a free gram of Gold signup and trade metals on BullionVault.com (CLICK ME). Silver bullion coins - Which should you buy?